It’s hard to believe it, but it was nearly a year ago that I blogged about the awesomeness of giveaways and shared a few things that I have learned about them through the world of social networking. Since then, I have entered countless of them myself – sometimes to great avail (hello awesome Julie’s walkman giveaway + Shelby’s Larabars!) and others, well, y’know, it was all in the name of fun. Seriously. Through giveaways, I have discovered a lot of great blogs, and from those blogs, more blogs (by reading comments and such) and it’s just a win-win if you ask me! In the spirit of these positive feelings, I am EXTREMELY pleased to announce that nearly 10 months after I announced I *might* be hosting my VERY FIRST giveaway, it is finally here! And even better, it is for a product that I am totally enamored with, and KNOW you will love, too! So, what is this mystical, magical item that I will be giving away to ONE lucky reader? Super amazing, TOTALLY UNSLIPPABLE and cute-to-boot Sweaty Bands! Now, if you think that this is just an ordinary headband, well sister – you’d be totally wrong. And you know what – I was skeptical too – I mean, I have tried many headbands in the past, and with my super-fine wavy hair, I was pretty much resigned to the fact that I would just have to deal with my bangs in my face and sweat in my eyes. Even my beloved Lulu headband, that did its job pretty well for training runs – was totally useless when I hit the mat with Bikram. But it all changed, just about two weeks ago. See, I was browsing the Charlottesville Marathon Expo, which was taking place downtown, when I noticed these colorful headbands on display at the C’ville Running Company’s booth. I had seen them before, at previous expos and was always intrigued by their prettiness, but figured they were just that. Still, something compelled me to that headband – maybe it was the color combo – or the fact that I had cash in my wallet (I cannot keep cash to save my life!) but within a few minutes, it was off the rack…and on my head! From there, I traversed the Downtown Mall and popped into Bikram Charlottesville for some afternoon yoga. Surely, 5 lbs of sweat and 26 postures would be an endurance test for my new fitness accessory! Not even an inch! It was like GLUE. I was astonished. Over the next week, I remained in AWE. From my treadmill workouts, to pilates DVD, 30 -day shred and even impromptu “can I make this thing budge” tests, it withstood all tests I set before it. She could be yours! For just 4 payments of $29.99 – wait, that’s not right?! All you have to do to be entered to win is leave a comment and tell me what your favorite fitness accessory is. Follow me on twitter + leave a comment here to let me know! If you already do follow me, you can also leave a comment! Follow Sweaty Bands on twitter + leave a comment! 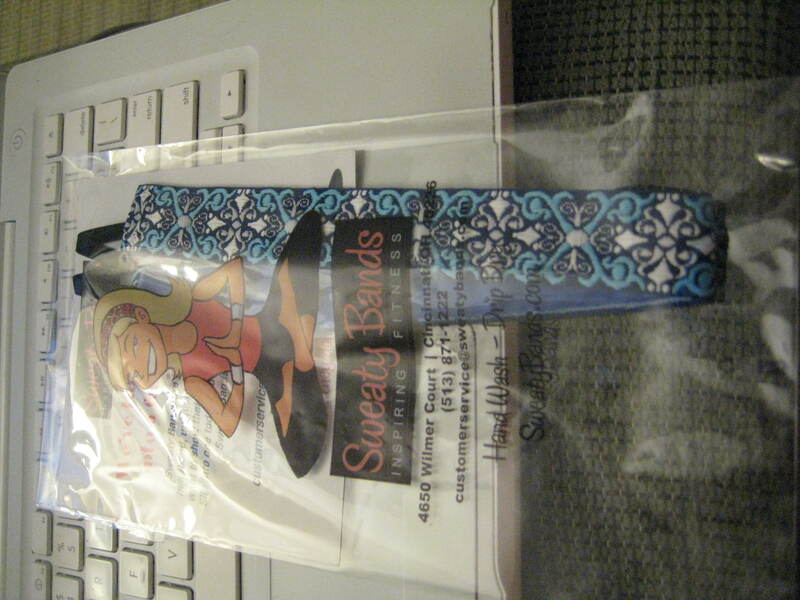 Tweet “I just entered to win a @SweatyBands from @krissymmurphy ‘s Shiawase Life – http://wp.me/pJlTK-nH” + leave a comment! s0 you have until APRIL 23 (SATURDAY, MIDNIGHT, EST!) to enter, so hop to it! I love it! I have the worst luck with my workout headbands. My favorite workout accessory is a good sportsbra. Does that count? And my life has changed because of my manduka yoga mat. So those two, for sure! I follow sweaty bands on twitter. I wear a green hankie around my neck when it’s cool out! Many of my race photos have that bit of green! My favorite workout accessory has to be my Garmin! I only use it outside (DUH!) and I love seeing how fast my paces are for track days! I follow Sweaty bands on Twitter! For a favorite fitness accessory, I’d have to go with my cheapo sneakers from Old Navy. Super flat on the bottoms, without any of the molded weird curvy contours that make my feet cry out with rage. Also: I’m totes following you on the Twitter now. i don’t do twitter, but i’d love to test these sweaty bands myself! i have crazy “wispies” up front that look ridiculous after just a little bit of exertion. it’d be nice to get them tamed a bit! my favorite accessory is my husband. he’s a great work out partner, encouraging me, challenging me, and entertaining me whenever we’re out there together! cheesy answer, but the truth. plus we’re pretty lo-tech here when it comes to working out. I usually wear those skinny black elastic-y headbands, but they always slip even when they have the rubbery stuff on the bottom. And they are NOT cute. Boo. My favorite accessory is BLUETOOTH HEADPHONES. OMG. They were not very expensive (maybe around $30-35 on Amazon, and I used Swagbucks gift cards to purchase, so basically free!) and they connect to my iPhone wirelessly. No more weaving a wire awkwardly through my shirt or accidentally whacking the wire with my arms as they whip around (I know, what a visual). The only downside is that they have to be charged – just another dang electronic to charge up – but it’s soooo worth it. Aaaand I already follow you on Twitter. And I’m about to follow SweatyBands and leave the Sweaty/Krissy (LOL) Tweet!Standby! tell me more about these swagbucks! Oh goodness, my daughter and I both need one of those headbands. Our new hair always escapes our ponytail and the nonslip elastics I got at Walmart do not stay put. And I tweeted that I entered! I hope I win!! 🙂 I’m dying to see if these things will work in my thick hair! I absolutely can’t work out without my iPod. But will they stay in place for a VIP tour? And do they come in plaid and are Chris W approved?